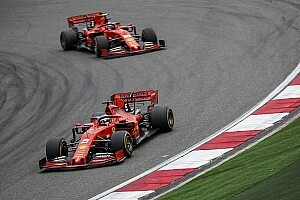 Salinas started the race day from the No. 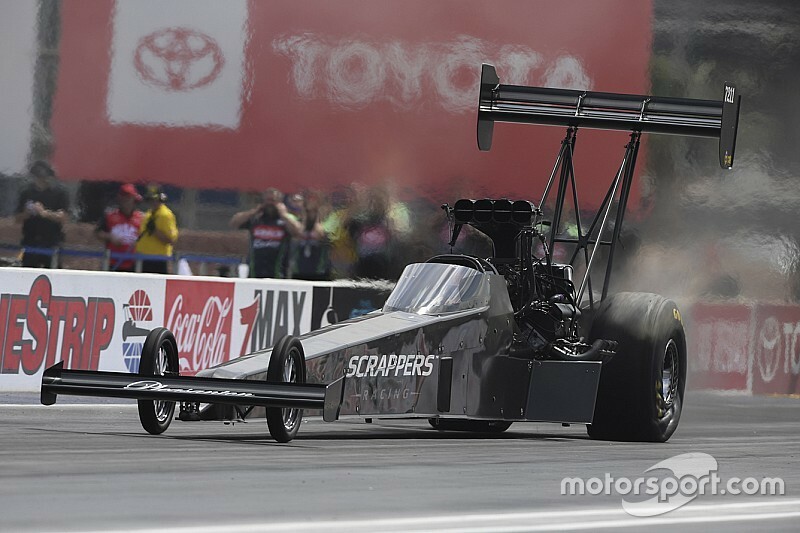 1 qualifier position and powered his Scrappers Racing dragster to a victorious 3.801-second, 330.39 mph pass when he outran Brittany Force, Clay Millican and Doug Kalitta. 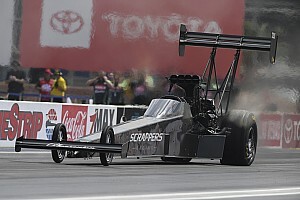 Force finished as the Top Fuel runner-up. Reigning Funny Car world champion Todd drove his DHL Toyota Camry to victory with a 3.970 pass at 319.07. He has won three consecutive events at the Las Vegas track and on this occasion beat Tommy Johnson Jr., Jack Beckman and No. 1 qualifier Tim Wilkerson, with Johnson Jr. coming in second. “It’s all Kalitta Motorsports,” said Todd. “It seems like ever since I’ve come on board with this team, we’ve always run well here. Bo Butner picked up his third win of the 2019 season with his Jim Butner's Auto Chevy Camaro team with his 6.677 pass at 206.67. The 2017 champion got the final win light of the day with his triple holeshot victory over Matt Hartford, Jason Line and Greg Anderson. Hartford was runner-up. Hector Arana Jr. picked up the win on his Lucas Oil EBR amongst a quartet of champions consisting of reigning champ Matt Smith, five-time champion Andrew Hines and four-time champion Eddie Krawiec. M. Smith came in second as Hines broke on the starting line and Krawiec fouled with a red light start. Arana Jr. won with a 6.907sec pass at 195.97 to pick up his second win at the Strip at Las Vegas Motor Speedway facility. “That Lucas Oil motorcycle, she’s bad to the bone,” Arana Jr. said afterward. “That’s just a testament to my team and the consistency. We weren’t the fastest but we were consistent all weekend. TOP FUEL: 1. Mike Salinas; 2. Brittany Force; 3. 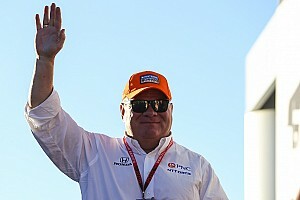 Doug Kalitta; 4. Clay Millican; 5. Steve Torrence; 6.vBilly Torrence; 7. Terry Totten; 8. Richie Crampton; 9. Terry McMillen; 10. Scott Palmer; 11. Antron Brown; 12. Leah Pritchett; 13. Cameron Ferre; 14. Steven Chrisman; 15. Austin Prock. FUNNY CAR: 1. J.R. Todd; 2. Tommy Johnson Jr.; 3. Jack Beckman; 4. Tim Wilkerson; 5. Matt Hagan; 6. 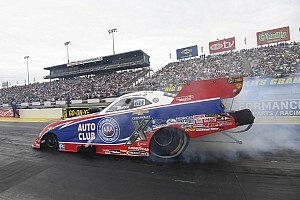 John Force; 7. Ron Capps; 8. Jeff Diehl; 9. Cruz Pedregon; 10. Gary Densham; 11. Bob Tasca III; 12. Shawn Langdon; 13. Phil Burkart; 14. Terry Haddock; 15. Robert Hight; 16. Jim Campbell. Final: J.R. Todd, Toyota Camry, 3.970, 319.07 def. Tommy Johnson Jr., Dodge Charger, 3.975, 313.29 and Jack Beckman, Charger, 4.370, 213.16 and Tim Wilkerson, Ford Mustang, 4.401, 205.35. PRO STOCK: 1. Bo Butner; 2. Matt Hartford; 3. Jason Line; 4. Greg Anderson; 5. Chris McGaha; 6. Alex Laughlin; 7. Jeff Isbell; 8. Erica Enders; 9. Steve Graham; 10. Alan Prusiensky; 11. Shane Tucker; 12. Joey Grose; 13. Jeg Coughlin; 14. Rodger Brogdon; 15. Fernando Cuadra; 16. Deric Kramer. PRO STOCK MOTORCYCLE: 1. Hector Arana Jr; 2. Matt Smith; 3. Eddie Krawiec; 4. Andrew Hines; 5. Karen Stoffer; 6. Hector Arana; 7. Jerry Savoie; 8. Angie Smith; 9. Angelle Sampey; 10. Steve Johnson; 11. Joey Gladstone; 12. Cory Reed; 13. Ryan Oehler; 14. Kelly Clontz; 15. Jim Underdahl; 16. Freddie Camarena. TOP FUEL: 1. Doug Kalitta, 319; 2. Mike Salinas, 286; 3. Steve Torrence, 256; 4. Leah Pritchett, 244; 5. Richie Crampton, 233; 6. (tie) Clay Millican, 231; Billy Torrence, 231; 8. Brittany Force, 224; 9. Terry McMillen, 198; 10. Antron Brown, 184. FUNNY CAR: 1. Robert Hight, 363; 2. Jack Beckman, 297; 3. Tommy Johnson Jr., 283; 4. J.R. Todd, 280; 5. Matt Hagan, 271; 6. John Force, 258; 7. Tim Wilkerson, 246; 8. Ron Capps, 205; 9. Bob Tasca III, 198; 10. Cruz Pedregon, 179. PRO STOCK: 1. Bo Butner, 425; 2. Alex Laughlin, 285; 3. Matt Hartford, 284; 4. Jason Line, 261; 5. Erica Enders, 239; 6. Jeg Coughlin, 225; 7. Rodger Brogdon, 220; 8. Greg Anderson, 208; 9. Deric Kramer, 199; 10. Chris McGaha, 189. PRO STOCK MOTORCYCLE: 1. Andrew Hines, 201; 2. Hector Arana Jr, 198; 3. Eddie Krawiec, 188; 4. Matt Smith, 170; 5. Jerry Savoie, 105; 6. Joey Gladstone, 103; 7. Karen Stoffer, 88; 8. Ryan Oehler, 87; 9. (tie) Hector Arana, 85; Jim Underdahl, 85.